Portable fire equipment if your first line of attack fire fighting equipment is the responsibility of the Owners, Leasers, Agents and/or Managers of the premises and must be carried out on a six (6) monthly basis. Fire Protection Services experienced technicians can advise you on which extinguisher best suits for your risk areas and perform routine testing and maintenance of your fire extinguishers to ensure they are functioning correctly and are appropriate for your fire risks. Our experienced technicians: test all equipment in accordance with Australian Standards our routine maintance program ensure your equipment are requlary serviced on time, with accompanying certificates of inspections. 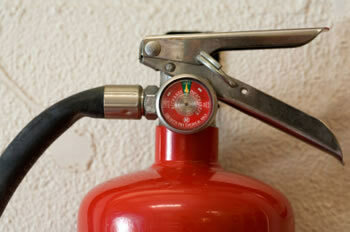 Fire Protection Services has it own filling stations to carry our refilling and pressure tests. Fire extinguisher hydrostatic testing, repair, refurbishment and refilling including –Dry Powder, wet chemical, foam, water and. As prescribed in the Australian standards AS 1851 part 1. Fire Extinguisher hydrostatic testing, repair, refurbish and refilling including: - Co2 as prescribed in the Australian Standards AS 1851 part 1 and wheeled fire extinguishers as prescribed in the Australian Standards AS1851 part 13 as a licensed test station.